Karamoja | Tomorrow’s Business & Investment Opportunities?? Last year, I received several proposals to the same “so-called lucrative business”. It was very exciting to listen to and all of them were very passionate about this new way of making money. They individually came in all ways; be-it the corporate guys, students, young and old among others. I truly admired their sales abilities that would only be matched by probably the aggressive Insurance sales agents. They spoke of how they were making money and just bragged about amassing that kind of wealth without a hustle. This was a contrary to many Ugandans who will not tell you or anyone else how well they are doing financially, even to the extent of not disclosing to their spouses and their best friends. These guys always talked good about their weekly earning which of-course could make you smell a rat. Unlike Brian, many business savvy individuals were busy signing up to earn make a cool USD 100.00 (approx UGX 250,000/=) weekly. This however, didn’t last long as the story is now very different a couple of months later. What started as a rumour was confirmed when officials from Uganda’s Central Bank (BoU) and several other countries in Africa and beyond declared this “so-called lucrative business” a pyramid scheme. All of a sudden, all the vibrant sales people that were everywhere went silent. 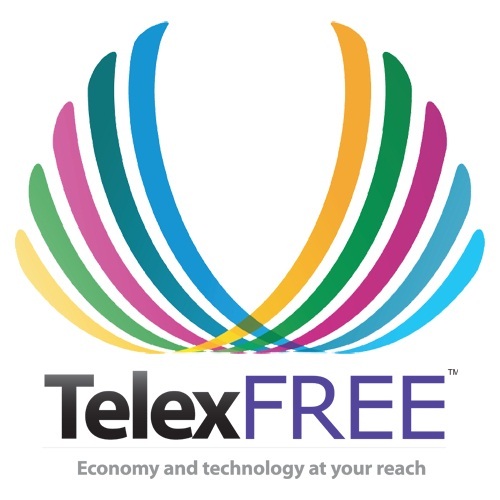 It was Telex FREE. Since then, many people have given testimonies of how they declined these sweet deals with some going ahead to brand the culprits of the scheme as shallow minds and so forth. Personally, I haven’t heard from the so-called investors and I am sure not many (if any) have heard from them which is a sign of shame and guilt. 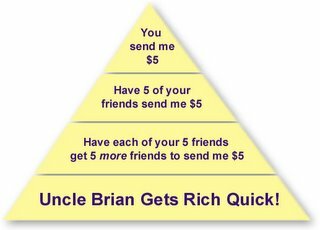 A pyramid scheme (also known as gift circles) is an unsustainable business model that involves promising participants, payment or services, primarily for enrolling other people into the scheme, rather than supplying any real investment or sale of goods or services to the public. A successful pyramid scheme combines a fake yet seemingly credible business with a simple-to-understand yet sophisticated-sounding money-making formula which is used for profit. The essential idea is that an impostor (call him Investor) makes only one payment. To start earning, the Investor has to recruit others like him who will also make one payment each. The Investor gets paid out of receipts from those new recruits. They then go on to recruit others. As each new recruit makes a payment, the Investor gets a cut. He is thus promised exponential benefits as the “business” expands. Such “businesses” rarely involve sales of real products or services to which a monetary value might be easily attached. 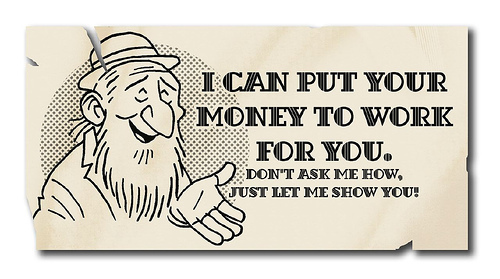 However, sometimes the “payment” itself may be a non-cash valuable. To enhance credibility, most such scams are well equipped with fake referrals, testimonials, and information. The weakness is that there is no end benefit. The money simply travels up the chain. Only the originator (sometimes called the “pharaoh”) and a very few at the top levels of the pyramid make significant amounts of money. The amounts dwindle steeply down the pyramid slopes. Individuals at the bottom of the pyramid (those who subscribed to the plan, but were not able to recruit any followers themselves) end up with a deficit. The network marketing or multi-level marketing business has become associated with pyramid schemes. Many multi-level marketing schemes simply use the product to hide their pyramid structure. While some people call multi-level marketing schemes in general “pyramid selling, others use the term to denote an illegal pyramid scheme masquerading as multi-level marketing schemes. Not all multilevel marketing plans are legitimate. If the money you make is based on your sales to the public, it may be a legitimate multilevel marketing plan. If the money you make is based on the number of people you recruit and your sales to them, then it’s a pyramid scheme. Ethical companies are about products FIRST. In a pyramid scheme, people are compensated for selling the business opportunity. The higher you are in the pyramid, the more money you make. But in this system, members of the pyramid make money when people JOIN, not when they SELL SOMETHING. This is the critical difference between a pyramid scheme and a legitimate network marketing or direct sales opportunity. In a legitimate company, if the person you recruit doesn’t sell something, you don’t make money. A pyramid scheme is similar to a Ponzi scheme in that both are based on using new investors’ funds to pay the earlier backers. One difference between the two schemes is that the Ponzi mastermind gathers all relevant funds from new investors and then distributes them. Pyramid schemes, on the other hand, allow each investor to directly benefit depending on how many new investors are recruited. In this case, the person on the top of the pyramid does not at any point have access to all the money in the system. For both schemes, however, eventually there isn’t enough money to go around and the schemes unravel. Here in Uganda, we have had a share of all these. In 2011, we witnessed the little known Reilag Investments Limited and Mint Consults Limited flourish to become the talk-of-the-town but withered even a lot faster. This was a Ponzi scheme engaged in Online Forex Trading and promised returns as high as 20 -30% per month. Talking of the Pyramid Schemes or commonly known as the gift circles, we have had a number of them since 2003 and a few examples are the likes of COWE (Caring for Orphans, Widows and Elderly), Team and Dutch International in Jinja, as well as Triple Nine at Arua Park among others. There are a lot of pyramid schemes that like to disguise themselves as legitimate direct-selling companies. That creates an environment where there can be confusion. Besides, the schemers have developed an art that tricks potential victims. Below are many pointers that should get your mind thinking to further scrutinize these businesses and save you from the pyramid schemes? Be aware of hype and ground floor opportunities. Although some people might claim you earn more money if you get in first, this is never the case and these are companies that normally fold within the first couple of years if not months. Always confirm that there is a legitimate product involved. Know what you’ll get in return for your start up investment, other than the potential to earn good money. If you’re not getting a product or service or if the training tools appear to be overpriced you could have discovered a scam. Ask if the company buys back any unsold product? Most network marketing companies have a money back guarantee which means that if you are unhappy with the products you can send them back for a refund. Given that the majority of your start-up kit was product, if you’re not happy with the business you should be able to send back any leftover product to refund most of your start-up costs. Naturally a pyramid scheme is not going to refund your money. If it sounds too good to be true, it probably is. Be mindful of get rich quick schemes. Although there is a lot of potential to earn very good money in network marketing very few have made it quick, most make their millions through consistent effort. They’ll usually make promises of high, guaranteed investment returns with little or no risk. One should be suspicious of any guarantees that an investment opportunity will perform a certain way, as all investments have some degree of risk. Are you being pressured to make a decision? It’s then time to think again. It’s very important that you take the time to make your own independent decision. The company offers commissions and/or bonuses to more than four levels of “distributors”. Ask whether the company pays overrides to distributors in a hierarchy of more levels than are functionally justifiable. Paying commissions and bonuses on more than four levels in an MLM program primarily enriches those at the top at the expense of those at the bottom. Ask whether participating “distributors” advance their position (and potential income) in a hierarchy of multiple levels of “distributors” by recruiting other “distributors” who in turn advance by recruiting distributors under them, etc.? If so, the result is self-appointment through recruitment to ascending payout levels in the distributor hierarchy. If the only way a person can profit significantly in the scheme is through recruiting to advance to higher payout levels (or to buy another’s down-line), this strongly indicates a pyramid scheme. Company payout per sale for each up-line participant equals or exceeds that for the person selling the product, creating inadequate incentive to retail and excessive incentive to recruit — and an extreme concentration of income at the top. Overly consistent, positive returns. One should be suspicious of any investment that continues to generate regular, positive returns despite the overall market conditions and economic state of affairs. In conclusion, anyone can be a victim of Ponzi and Pyramid schemes. It’s very important that you always look out for possible scam before you commit any funds to any business. When in doubt always seek an independent professional opinion.